Bubba saw some amazing mosaics in Ravenna. He really liked the idea of putting little squares together to make big things. Bubba said it reminded him of his childhood. From Ravenna, he jumped a train for Venice. 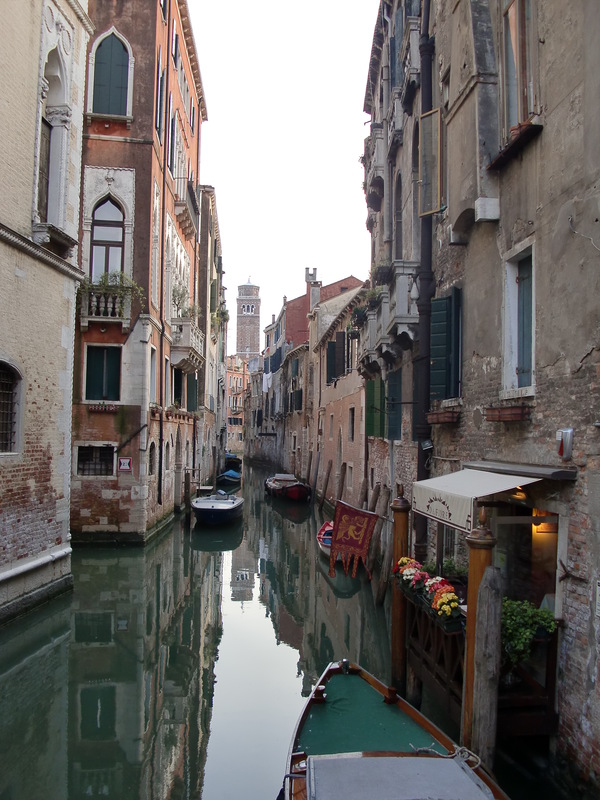 Venice is a little scary to me. 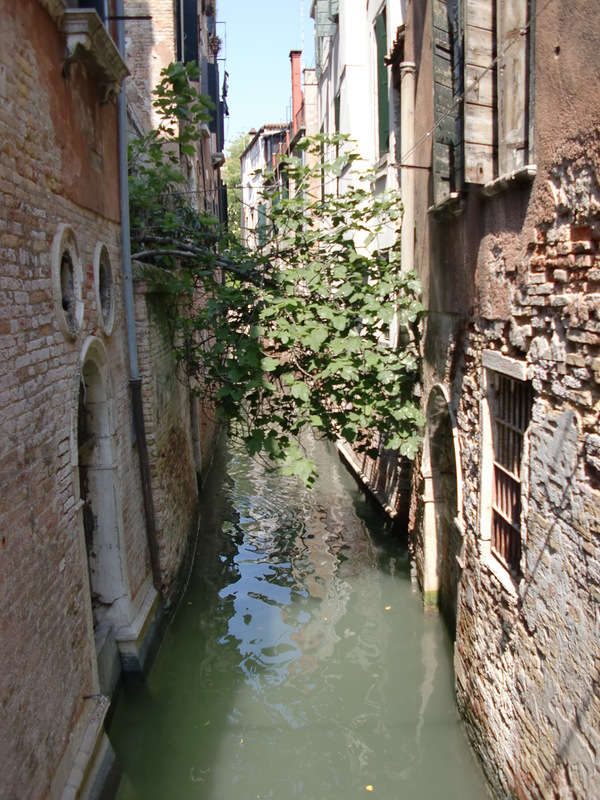 It is a maze of narrow alleys crisscrossing tiny canals. That is the scary part. I can float, but I can’t swim. I was deathly afraid of falling into a canal and being swept away. Actually, in the evening, and away from the big tourist areas, there is a family feel. Hidden in the warren of narrow walkways are several piazzas; a church surrounded by a few businesses and a restaurant or two. You can see the opening to one of the piazzas in this photo. It is at the end of the street and the big clue is the tree. There are not too many places for trees to grow here. The trees take advantage of any place they can get a foothold, even a crack in a wall. 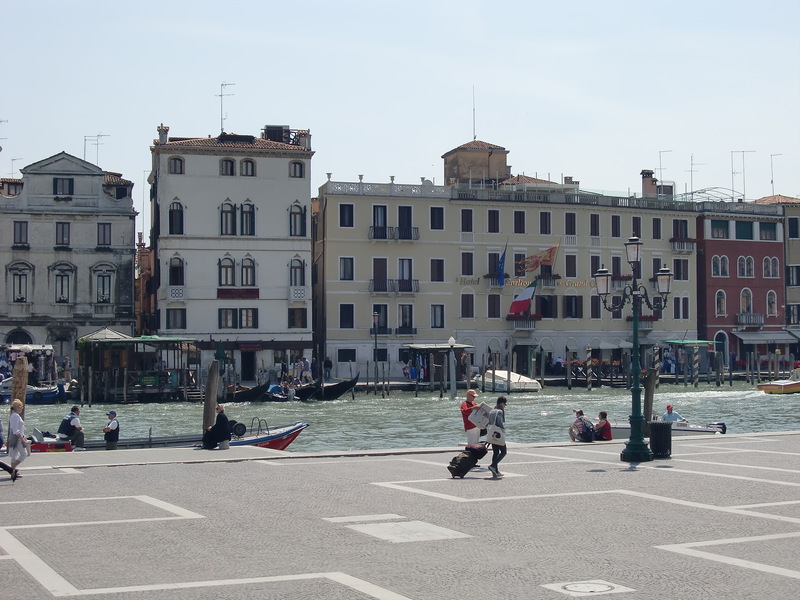 The most famous piazza is Saint Mark’s Square. 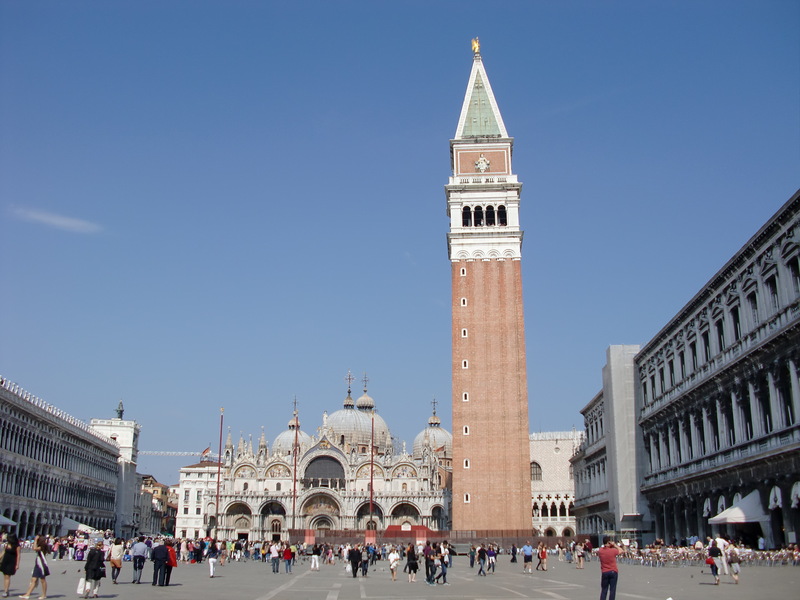 It is the home to the fabulous cathedral and the home of the Venetian Doges. This is where my problems started. In addition to all those feet to get under, high tide came. 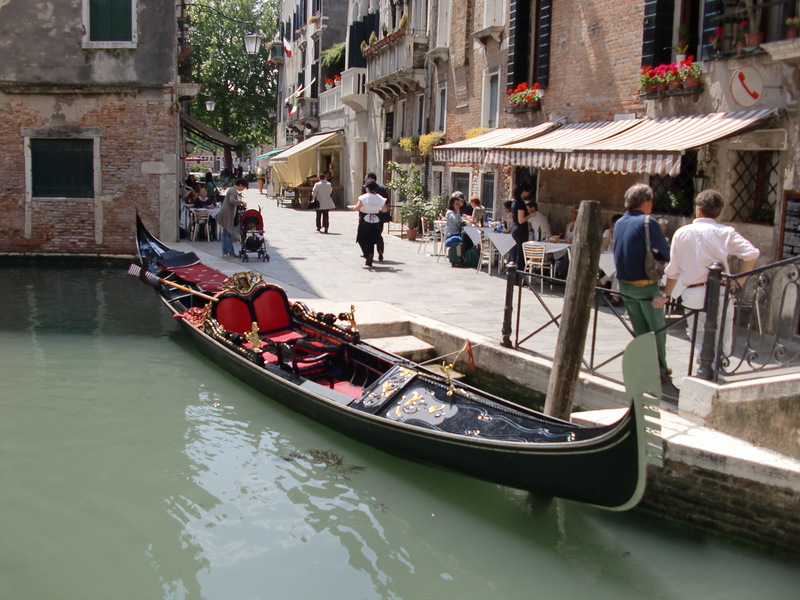 Venice is a low lying island and sea level rise is causing a great problem. 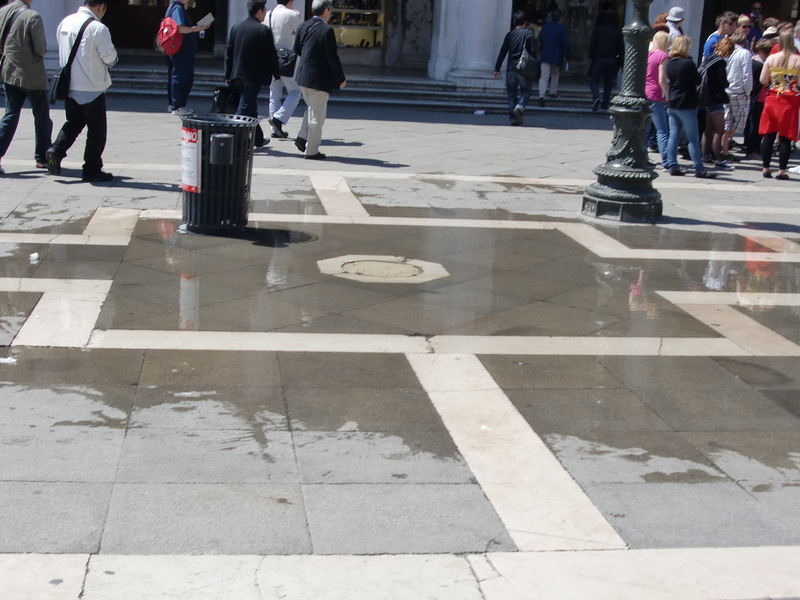 At high tide, this square begins to flood. The church has a moat built around it but, at times, temporary walkways have to be put in place. When I saw the water coming up through the drains, I panicked. I hopped up to the base of a statue but found a new danger. PIGEONS!! To them I was a small morsel to provide a light snack. I was terrified!! A quick swim back to the hotel to pack and I was outta there. 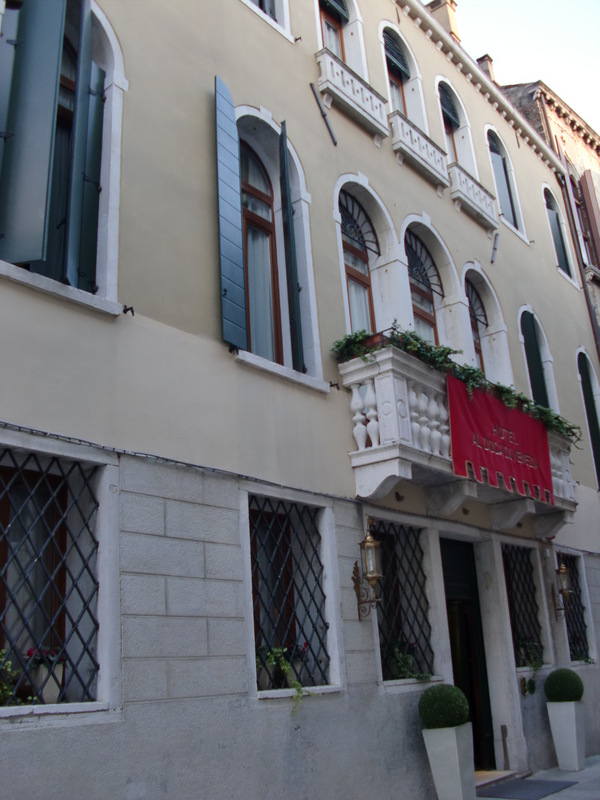 As a note, if you are ever in need of a hotel in Venice we highly recommend Hotel Al Duca di Venezia. Friendly staff, and great location. But back to Bubba. I needed someplace a little drier and without the pigeons. I hopped a ride on the first wheelie bag I could find and boarded a train to Verona where I met up with Rick and Spider. They decided to drive for the next few days. 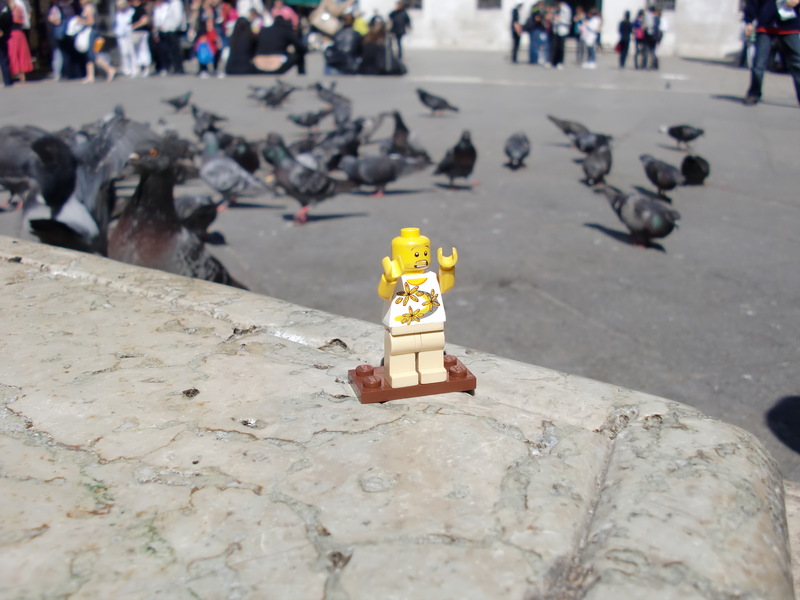 This entry was posted in Holiday, Humor, italy, Legos, Travel and tagged humor, italy, Saint Marks, travel, Venice, Venice Canal, Venice hotel. Bookmark the permalink.